For the past year and half, Venue (420 14th St.) has established itself as a popular nightclub, bar, and performance hall in an increasingly bustling stretch of downtown Oakland. Now, owner Oscar Edwards is getting into the restaurant game. Or, to put it more accurately, the pop-up restaurant game, where the chefs rotate, the food is as diverse as the city itself, and no two visits are likely to ever be the same. 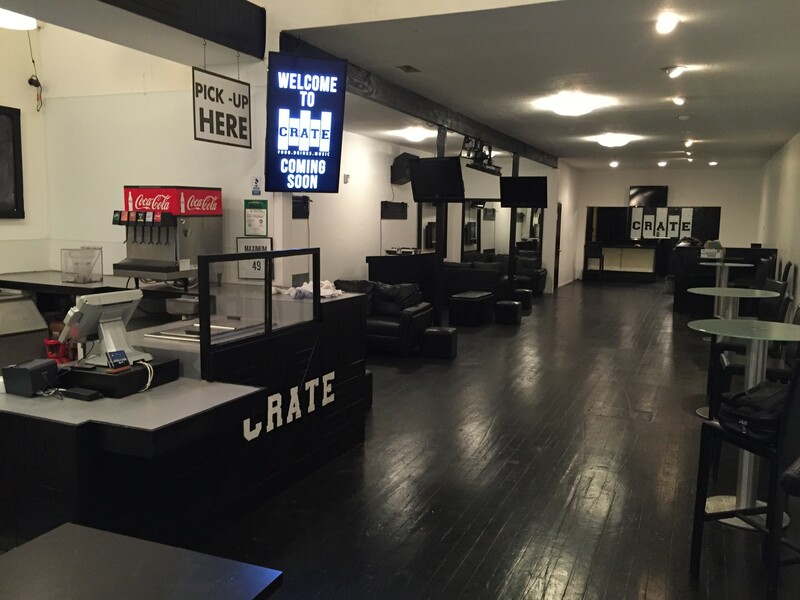 The new program, which Edwards is promoting as a “permanent pop-up restaurant,” is called Crate, and it is nothing if not ambitious. Crate will occupy the entire ground floor of the three-story, multi-purpose Venue, and in addition to serving both lunch and dinner, the pop-up space will also have a full bar, a DJ booth, and a gallery space for displaying both physical and digital artwork. The idea, Edwards said, is to create a space centered on food, music, and art — and to find ways for all three to complement each other. Crate will launch at 5 p.m. on Friday, April 3, and will coincide with that evening’s First Friday festivities. Edwards, a Los Angeles transplant, said he drew inspiration from a permanent pop-up in Dallas, Texas called Kitchen LTO (“Limited Time Only”), whose premise is to change chefs and design concepts — essentially reopening as a brand new restaurant — twice a year. But for East Bay diners, Crate’s rotating lineup of chefs will likely bring to mind Oakland’s Guest Chef, the Rockridge restaurant that pioneered this “permanent pop-up” business model before it closed in 2013. Like Guest Chef, Crate takes a percentage of each pop-up’s overall sales — a 15 percent cut, in Crate’s case — in exchange for use of the fully equipped kitchen and forty-seat dining area. (Edwards also charges a $100 daily rental fee.) And, as with Guest Chef, what Crate offers is a physical location that will allow food truck operators, caterers, and other up-and-coming chefs to bring their food to a wider audience. Unlike at Guest Chef, however, chefs at Crate will rotate frequently, rarely staying on for more than a week at a time — in fact, there might be a different pop-up in place at dinnertime than there was during the lunch shift. The Rockridge pop-up space always rented out its kitchen for at least two weeks at a time — a big commitment for newcomers who had never run a restaurant before. Meanwhile, for the art and music components, Edwards said the idea is for there to achieve a synthesis whenever possible. In some cases, a chef might bring in his or her own artist and DJ to produce one cohesive experience. Other times, a chef serving, say, Southern-style biscuits might just request that the DJ play soul music. Co Pollard serves up a fully loaded pastrami link. And if all of this weren’t ambitious enough, Edwards also plans to offer SpoonRocket-style delivery service throughout downtown Oakland for customers who order ahead of time. The lineup for the April 3 launch is still being finalized, but Edwards said he has been in talks with folks ranging from Fivetenburger (one of the most popular food trucks in the Bay Area) to Smelly’s Creole & Soul Food (a catering business) and Co Pollard, who sells his signature grilled pastrami links from a small street cart in East Oakland. Edwards pointed to the latter two as precisely the kind of food businesses that, while they already have a devoted following, could benefit from the exposure they’d get from making regular appearances at Crate. “It’s going to be a good thing for Oakland,” Edwards said.